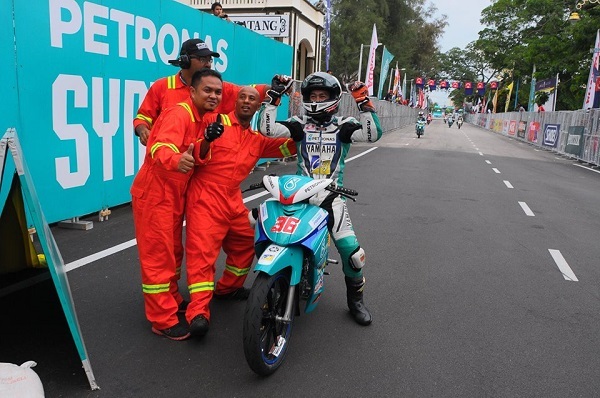 The third round of the 2015 PETRONAS AAM Malaysian Cub Prix Championship became an early celebration for PETRONAS Yamaha-CKJ rider, Mohd Affendi Rosli who led the race to his first CP130 victory this season ahead of two other Yamaha stablemates, Ahmad Fazli Sham and Abdul Muhaimin Roslan. Having to rough up four riders ahead of him on pole, Affendi launched a sudden attack to jump the lead in the first turn before clearing off a gap to secure his position. His move however was made harder by Mohd Azhar Abdul Jalil of Motul Yamaha YY Pang who tailed him a few laps before being overtaken by Abdul Muhaimin while Fazli kept a safe distance behind in lap 9. By lap 11, Muhaimin had already taken control of the battle for second with Fazli moving up the ranks in third. When the coast is clear, Fazli made his signature move and accelerated hard to close the five seconds gap left by Affendi by Muhaimin kept off unwanted confrontations by riders behind. Affendi’s lead seemed to be shaken a little as Fazli approaches but the narrow Muar track did little help to nudge the front-runner to cross the finish line first in 16:08.555s while Fazli came in second (16:08.768s) ahead of Muhaimin in third (16:17.087s). Fourth and fifth place went to Ahmad Fazrul Sham (Yamalube AHM) and Mohd Fitri Ashraf Razali of PETRONAS Yamaha-CKJ. Fazli however still leads the chart with 48 points ahead of Elly Idzlianizar (42 points) and Muhaimin (41 points). Affendi now went up to fifth overall with 33 points behind Mohd Zamri Baba (40 points). In the CP115 category, another promising Yamaha apprentice, Kasma Daniel Kasmayudin took to the podium in first place ahead of Mohd Fareez Afeez and Mohd Syafiq Rosli. Kasma of PETRONAS Yamaha Maju Motor crossed the finish line in 13:51.526s, about 3 seconds clear ahead of Fareez while Ahmad Abdul Kadir (Motul Yamaha YY Pang) and Mohd Izrul Huzaimie Amran (PETRONAS Yamaha-CKJ) finished seventh and eighth respectively. Though crashing out in lap 4, Tengku Amirul Haffirudin still leads overall with 50 points while Kasma now moves up to second with 45 points. Fareez sits in third with 29 points ahead of Mohd Izzat Zaidi (29 points) and Ahmad Syukran Aizat (26 points). In the Wira class won by Mohd Harith Farhan Baharin, Team PETRONAS Yamaha riders, Mohd Izzat Rafiq came in seventh while Mohd Amirul Arif Ramlee and Mohd Akid Aziz finished 11th and 13th.